A California technology company has been actively testing a system that enables two tractor-trailers to platoon - similar to "drafting" in a NASCAR race - to improve diesel mileage rates and safety. Peloton charges a few cents per linked mile for the system, and says the resulting savings enable a payback of 3-4months. Peloton Technology (Menlo Park, CA) is developing a system that uses radar-based collision mitigation equipment and truck-to-truck communication to automate the platooning relationship between two trucks. The truck-to-truck communication enables the trucks to react in a few hundredths of a second in the case of something in front of them, dramatically faster than a human driver. The driver of each truck remains in control and steers the vehicle, and can elect to instantly exit the platoon system at any time. Video systems increase driver awareness and assist with lane-keeping and driver-alertness. On-board systems, GPS/telematics and fleet network operations tools optimize the routing and pairing of trucks, limit platooning to appropriate weather and road conditions, and enhance safety. The platooning also decreases diesel fuel consumption of both vehicles due to aerodynamic drag reduction. Peloton says the approach can lead to 4.5% fuel savings for the lead truck and a 10% savings for the rear. The technology synchronizes braking and acceleration, so that the two trucks can enter into a kind of symbiosis on the road, travelling at times with the rear truck as few as 20 feet behind the lead vehicle. A central operations center at Peloton's HQ takes in data from sensors on the two trucks, while also crunching data on weather, highway conditions and other variables. That is all used to determine whether it's safe for trucks to platoon, what their speed should be, and how much distance should be maintained between them. Peloton has tested distances ranging from 20 feet to 75 feet. Just two weeks ago, the Peloton system was tested on a stretch of I-80 in Nevada for the state's Department of Motor Vehicles, Department of Public Safety, and Department of Transportation. In the test, the paired trucks were spaced 40 feet apart. Though initially concerned about the safety of the technology, Nevada Highway Patrol Chief Dennis Osborne told a press conference after the test that "I feel safe about this project." The normal reaction time for the driver of a vehicle, Osborne said, is 1 to 2 seconds, depending on weather conditions, the driver's age, and other variables. The reaction time of the Peloton system is greatly faster. "We are talking fractions of a second, here, from the time the lead vehicle begins to brake." He called this reduced reaction time "an awesome selling-point." The Highway Patrol, he said, will continue "to watch this with a lot of interest." 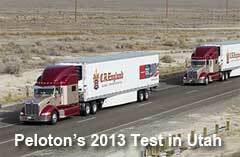 In late 2013, another test was performed in Utah, using CR England trucks equipped with the Peloton technology. Additionally, control trucks were also deployed, so that mileage comparisons could be made. The test were conducted under the supervision of the North American Council for Freight Efficiency. That test showed the fuel savings of 4.5% for the lead truck and 10% for the following truck, obviously the source for Peloton's claims cited above. The company also says it has analytics from the data it collects to provide insight on preventive maintenance, driver and truck effectiveness, and other safety-related issues. Peloton says it now takes about a week to retrofitting an existing tractor-trailer, but that it hopes to reduced that time soon. The company plans on making the system commercially available in 2015. What is your reaction to this truck platooning technology? What will be the operational challenges? Let us know your thoughts at the Feedback button (for email) or section (for web form) below.